As a kid I was very into Playmobil. As a six-year-old I got my first one, a blue construction worker with an orange helmet and a grey broom, in 1976, about a year after they became available on the Dutch market. Over the years in primary school I gathered a mountain of that stuff, to a significant extent self-financed from collecting old paper around the village, and selling it for recycling. Playmobil is manufactured in Nürnberg, or rather Zirndorf on the outskirts of it. We spent our summer holidays in Bavaria in 1976-1979, and on the way to our destination I once got my parents to drive to the factory. I had high hopes there would we some sort of shop or exhibition at the factory. There wasn’t. I remember standing disappointed in front of a grey building with closed gates, in the rain. Nürnberg is also the birthplace of Albrecht Dürer, a key Renaissance figure. In 1493 he created the oldest known painted self-portrait. 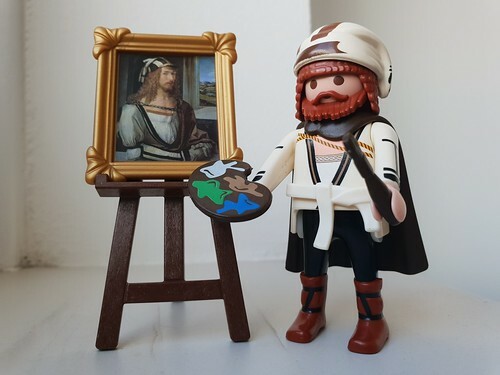 The tourist office of Nürnberg had a Playmobil figure made of the painter in action, the city’s most famous son. On the easel is not his first painted self portrait, but one from 5 years later, 1498 when he was 26. By the looks of it because it shows the man in an outfit that lends itself better for use on a toy figure. During check-out in the hotel lobby after IndieWeb Camp in Nürnberg, I spotted the Playmobil Dürer in a vitrine. How could I resist? 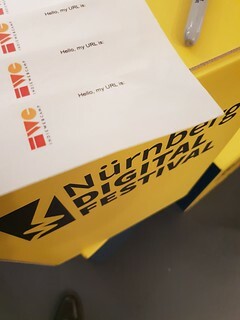 At IndieWeb Camp Nürnberg today I worked on changing the way my site displays webmentions. Like I wrote earlier, I would like for all webmentions to have a snippet of the linking article, so you get some context to decide if you want to go to that article or not. It used to be that way in the past with pingbacks, but my webmentions get shown as “Peter mentioned this on ruk.ca”. After hunting down where in my site this gets determined, I ended up in a file my Semantic Weblinks plugin, called class-linkbacks-handler.php. In this file I altered “get_comment_type_excerpts” function (which sets the template for a webmention), and the function “comment_text_excerpt”, where that template gets filled. 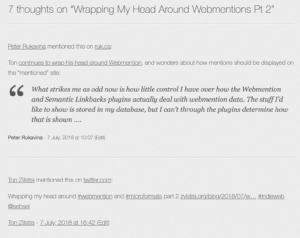 I also altered the max length of webmentions that are shown in their entirety. My solution takes a snippet from the start of the webmention. I will later change it to taking a snippet from around the specific place where it links to my site. But at least I succeeded in changing this, and now know where to do that. When the next update of this plugin takes place I will need to take care, as then my changes will get overwritten. But that too is less important for now. The webmentions for this posting are now shown as a snippet from the source, below the sentence that was previously the only thing shown. So, my webmention issues can’t be solved in the theme, as the content isn’t decided there. I need to dig deeper into the semantic-linkback plugin that I use to handle them. I found out that webmentions are mentioned in full if they are short enough, and that I can set that limit. So I now want to change the way webmentions are stored. To solve my main issue, I need to select x characters around the spot where my site is mentioned, and set the character limit for webmentions to x+1. Task 1 now complete. My blog declared 16 h-cards, one for each time my name was mentioned as author under the 15 blogposts on my front page, and 1 in the side bar. That last one is the only one I want to have, so I wanted to remove those underneath blogposts. To do that, I had to create a child theme of the theme I use, Sempress. I created it on my hosting server directly, not through WordPress. In the original theme I then hunted down the function used to show the author information for each posting, the sempress_posted_on function. This by viewing the various Sempress files in the WordPress internal Themes Editor. Then I copied that over to my child theme, and changed it. I simply removed the bits that turned my name into a link and all the h-card elements declared as classes around it. There’s no need to link to my author page here. I’m the only author, don’t have a profile page, and if you look at the ‘author archive’ it is a list of all the postings on this site. I also cleaned up my single remaining h-card, adding a “p-note” class so that the blurb becomes part of the h-card, and making sure it lists the e-mail addresses correctly now. The child theme I created will be useful for changing the way webmentions are presented on my blog as well. 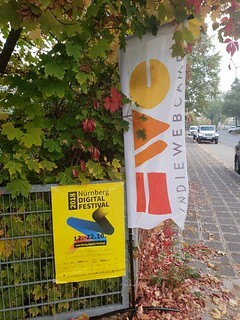 At IndieWebCamp Nuremberg this weekend. 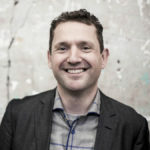 Together with Frank Meeuwsen, and most likely I’ll spend time figuring out how to best control the way Webmentions get presented on this blog. I’ll be driving there with Frank Meeuwsen. 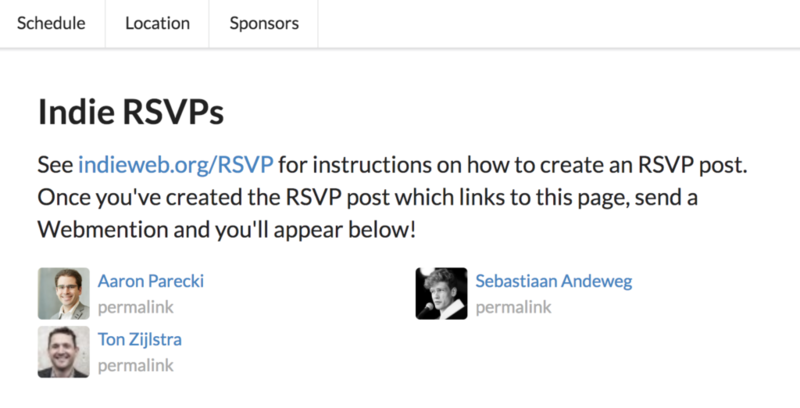 Had already registered, but this is a test to see if RSVPing from my own blog works (using webmention, and microformat to state that this is a rsvp). If a reference to me shows up at the mentioned URL, then yes, it worked. And it did work. 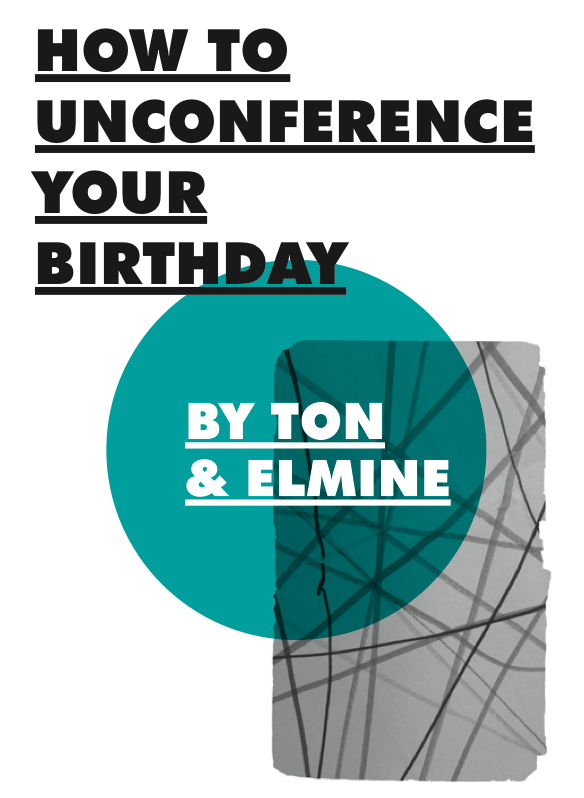 Here’s a screenshot of the event page. IndieWebCamp Nürnberg 2018 is a gathering for independent web creators of all kinds, from graphic artists, to designers, UX engineers, coders, hackers, to share ideas, actively work on creating for their own personal websites, and build upon each others creations.